WASHINGTON - The Obama administration is announcing a wide-ranging effort to use U.S. foreign aid to promote rights for gays and lesbians abroad, including combating attempts by foreign governments to criminalize homosexuality. The policy news comes as U.S. Secretary of State Hillary Rodham Clinton is telling other diplomats that cultural practices or religious tradition are no excuse for discriminating, or worse, against gay people. Making an unusually strong statement in defense of gay rights, Clinton says they are equal to women's rights and racial equality and should be universal human rights. She criticized nations that criminalize gay behavior or tolerate abuse of gay, bisexual or transgendered people, though she did not identify those nations by name. 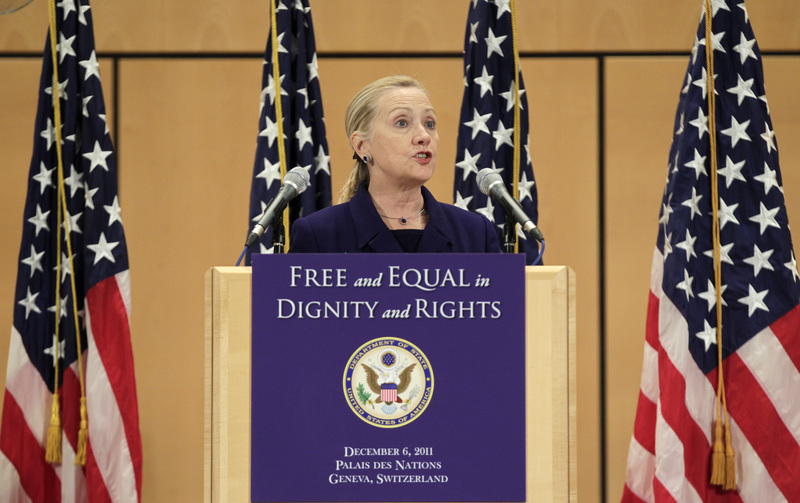 Clinton's audience in Geneva, home of the United Nations' human rights body, included diplomats from Arab, African and other nations with poor records on gay rights. The White House said Tuesday's announcement marked the first U.S. government strategy to combat human rights abuses against gays and lesbians abroad. The order also directs U.S. government agencies to use foreign assistance to protect human rights and advance non-discrimination, and work with international organizations to fight discrimination against gays and lesbians. Gay rights groups praised the order as a significant step for ensuring that gays and lesbians are treated equally around the world. "Today's actions by President Obama make clear that the United States will not turn a blind eye when governments commit or allow abuses to the human rights of LGBT people," said Joe Solmonese, president of the Human Rights Campaign, a gay advocacy organization. The presidential directive applies to all U.S. agencies involved in foreign aid, assistance and development, including the Departments of States, the Treasury, Defense and Homeland Security.